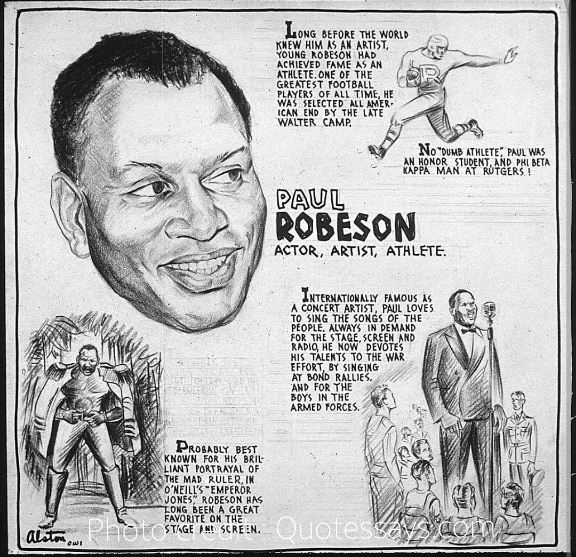 Paul Robeson was an African American singer, actor, and political activist. He crusaded for equality and justice for African Americans. Paul Leroy Robeson was born the last of eight children in the Robeson family, on April 9, 1898, in Princeton, New Jersey. His father, William Drew Robeson, was a runaway slave who fought for the North in the Civil War (1861–65), when Northern forces clashed with those of the South over secession, or the South’s desire to leave the Union. His father put himself through Lincoln University, received a degree in divinity, and was pastor at a Presbyterian church in Princeton. Paul’s mother, Anna Louisa Robeson, was a member of the distinguished Bustill family of Philadelphia, which included patriots in the Revolutionary War (1775–83), when the American colonies fought for independence from Great Britain. She also helped found the Free African Society, and maintained agents in the Underground Railroad, a secret system to help runaway slaves. Paul’s mother died when he was six and his father moved the remaining family to Sommerville, New Jersey. There, young Paul spent his childhood under his father’s influence, regularly working with him after school and also singing in his father’s church. From his father Robeson learned to work hard, pursue valuable goals, fight for his beliefs, and to help his people’s cause. Robeson graduated from the Columbia University Law School in 1923 and took a job with a New York City law firm. In 1921 he married Eslanda Goode Cardozo; they had one child. Robeson’s career as a lawyer ended abruptly when others within the firm turned on him because he was African American. He then turned to acting as a career, playing the lead in All God’s Chillun Got Wings (1924) and The Emperor Jones (1925). He added to his acting by singing spirituals. He was the first to give an entire program of exclusively African American songs in concert, and he was one of the most popular concert singers of his time. Robeson starred in such stage presentations as Show Boat (1928), Othello, in London, England (1930), Toussaint L’Ouverture (1934), and Stevedore (1935). His Othello (1943–44) ran for 296 performances—a remarkable run for a Shakespearean play on Broadway. While playing opposite white actress Mary Ure, he became the first black actor ever to do the role in England’s Shakespeare Memorial Theater. Robeson’s most significant films were Emperor Jones (1933), Show Boat, Song of Freedom (both 1936), and Proud Valley (1939). Charles Gilpin and Robeson, as the first African American men to play serious roles on the American stage, opened up this aspect of the theater for African Americans. Robeson used his talents not only to entertain but to gain appreciation for the cultural differences among men. During the 1930s Robeson entertained throughout Europe and the United States. In 1934 he made the first of several trips to the Soviet Union. He spoke out against the Nazis, Adolf Hitler’s (1889–1945) radical German army, and sang to Loyalist troops during the Spanish Civil War (1936–39), when battles erupted between Spain’s traditionalists and reigning Second Spanish Republic. In addition he raised money to fight the Italian invasion of Ethiopia, supported the Committee to Aid China, and became chairman of the Council on African Affairs (which he helped establish in 1937). A spokesman for cultural black nationalism (a radical movement that called for African Americans to set up their own self-governing nation), Robeson also continued to fight racial discrimination (forced separation people based on race). During World War II (1939–45), when the Allies—the United States, England, France, and the Soviet Union—battled German-led Axis forces, he supported the American effort by entertaining soldiers in camps and laborers in war industries. After the war, Robeson worked full-time campaigning for the rights of African Americans around the world. In a period of great paranoia within the nation, the American government and many citizens felt threatened by Robeson’s crusade for peace and on behalf of minorities. The fact that for over fifteen years he was America’s most popular African American did not prevent Robeson from being banned from American concert and meeting halls and being denied a passport to travel overseas. During the 1950s Robeson performed in black churches and for trade unions. After eight years of denial, he won his passport, gave a concert in Carnegie Hall, and published Here I Stand in 1958. He went abroad on concert, television, and theater engagements. He received numerous honors and awards: the National Association for the Advancement of Colored People’s (NAACP) Spingarn Medal, several honorary degrees from colleges, the Diction Award from the American Academy of Arts and Letters, numerous awards from labor unions and civic organizations, and the Stalin Peace Prize. Robeson returned to America in 1963 in poor health and soon retired from public life. Slowly deteriorating and living in seclusion, Robeson died on January 23, 1976, in Philadelphia, Pennsylvania, after suffering a stroke.